We told our children, when they were young, there was one reason why we were teaching them to read. Obviously reading is important, if not necessary, to survive in our culture but that is not the reason. We want them to be successful individuals. Ones that will not simply survive but thrive in their communities. But that is not why we were teaching them to read. Reading encourages the imagination and stimulates the brain in a way that mindless entertainment never can, this is just a bonus. We flat out told our children, that they were to learn to read, so they could read the Bible. Plain and simple. The Word of God is what will stand when the world is on fire. When trials and troubles come, the Word of God will bring comfort, healing and hope. Even in pre-reading days, we memorize Scripture, as a family to get the word of God in their little hearts. And, once they begin to read, we give them their very own Bible. My two oldest have already reached this milestone. It has melted my heart to see them reading their Bibles on their own, seeking and learning on their own accord. My daughter has been looking up to her brothers eagerly awaiting the day that she can have a Bible of her own, not just a storybook with Old Testament stories. Well, the time has come. She is in the beginning stages of reading, and I found the perfect Bible to present to her. The Beginner's Bible: Holy Bible in the King James Version, is everything that I hoped it would be as far as a first Bible goes. 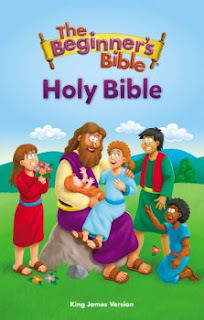 This Bible has large print, perfect for a beginning reader. It has the complete King James Version text and also includes full page illustrations throughout the book. It has a thick, solid cover that I hope will last many years to come. I look forward to this seeing her learn and grow with her first complete Bible! Disclaimer: This book was provided by Book Look Bloggers for the purpose of this review. All opinions expressed here are my own.